I know I don't normally do these sorts of posts but I just wanted to let you all know that I have a GHD hair straightener for sale. 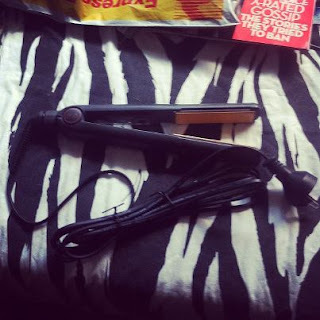 It's an older model straightener but there's nothing wrong with it; in fact, when it was sent away to have the cord replaced (I didn't want to sell it with my cat's chew marks in the cord) they said it's in great condition. It is only for sale because I was recently given a GHD from the Peacock Collection and I don't need two. As I mentioned in my May Favourites, June was a hectic month for me. Well, sort of. The start of June was. 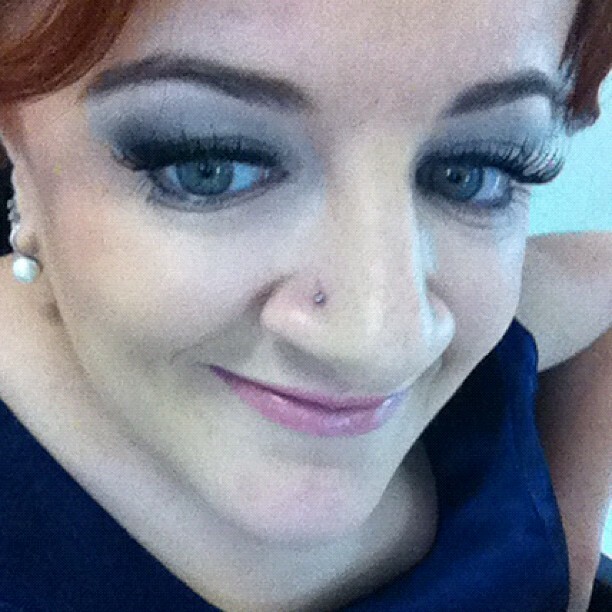 I had my sister's hens night at the start of June and then, the week after, we had her wedding. Both were fantastic day/nights but they definitely kept me busy. For that reason, I'm sorry I didn't blog as much as normal this month. I'll be a lot more regular again next month, I promise! Firstly I'm just going to list (and link) all the the products that I've already reviewed so I don't go around repeating myself. I know I've already reviewed those products but I've been loving them this month so I had to repeat myself just a little! I know I start every giveaway announcement post like this, but thanks to everyone who entered! 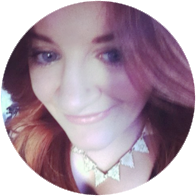 I love having new people follow this blog and enter giveaways. It's always so exciting. I'm not going to do a really long intro this time. Let's just get to the winner, shall we? Anyway, that's enough about me. Let's see who won a the Wild Child gift pack. A couple of weeks ago I placed a big order on LUSH UK. Why? Because, when you order as much as me, it turns out to be cheaper. I ordered a couple of products that aren't sold in Australia, as well as one that I would never pay the Australian price for. These two products are staples in my daily skincare routine (see my LUSH Skincare Challenge Week 11) and I don't think I could live without them. When I was waiting for this to arrive I completely ran out of Aqua Marina and my skin went crazy. I've always wanted to try a LUSH Solid Shampoo for a while so I figured how was as good a time as any. This is meant to reduce hair loss so we'll see! I've heard this moisturiser was designed for Princess Diana a while ago and, I figure, any moisturiser that's good enough for her is good enough for me. I've wanted to try LUSH's Gorgeous moisturiser for the longest time but I can't justify paying $99.95AUD for it. It's just too much. LUSH UK sells this product for £37.40 (can be converted to $56.42AUD) which is a lot more reasonable, even though it's still a lot. Only one of these conditioners, American Cream, is available in Aus. I got the other one just to try. These conditioners were a bit of a 'why not?' purchase. I've always wanted to try American Cream and Coolaulin (a coconut based conditioner for dry and damaged hair) appealed to me too. Last I went into LUSH to take part in their recycling program. I returned 5 empty black LUSH pots and received a free fresh face mask of my choice. I chose Brazened Honey. I also scored two samples; Mask of Magnaminty Cleanser (to be used as a face mask) and Enchanted Eye Cream. So that's my fairly substantial LUSH haul. As you can see, if you have a big shopping list it may be easier to go through the LUSK UK website. What do you think of the products I bought? Have you tried any of them before? Do you have any LUSH recommendations? Don't forget to enter the 1 Skin Solution giveaway! My June Lust Have It! box arrived today and, to be honest, it was pretty underwhelming. In saying that, though, last month's box was the best I've ever received from a beauty subscription service so my expectations very pretty high. This month Lust Have It! sent their boxes with a new courier service (bye, Australia Post) and subscribers no longer receive a dispatch notification and/or tracking number. Living so far away, I missed having the tracking number. No dispatch notification also meant that I had no idea whether my box was on its way or not. Oh well. It arrived safe and sound. This month's products came in a purple make up bag. 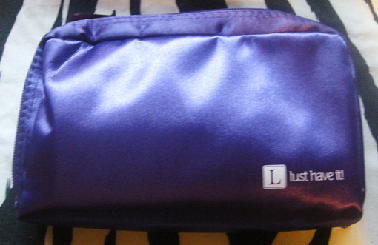 I'm still lovin' the make up bags, Lust Have It! I used one recently actually. I think I will also use these bags for packaging for a couple of giveaways I have coming up. Stay tuned! 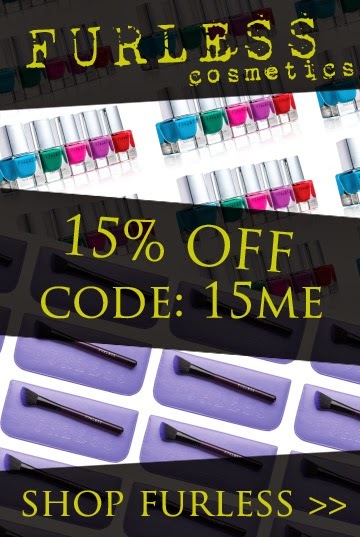 I've been a follower of this blog for a while you'll know I'm incredibly impatient, especially when it comes to beauty products. I've recently read a lot about a new Revlon lip product, the Just Bitten Kissable Balm Stain, and I decided to order a couple off eBay. They arrived yesterday and I'm already in love. I got two Just Bitten Kissable Balm Stains; Honey and Rendezvous. These lip products are much like Clinique's Chubby Sticks or Face of Australia's Sheer Gloss Lip Crayons (as well as Tarte's LipSurgence Lip Tints if you're in the US). They're basically a large lip crayon. To be honest, I really like the idea behind the design of these products. I don't know what it is, maybe a novelty factor, but I just think they're cool. They have a wind up mechanism, meaning you can wind them down or up as you please and not have to worry about a sharpener. These lip products are really pigmented. I'm terrible at explaining colours but, essentially, I have Honey (a beige/rose colour) and Rendezvous (a bright orange colour). Throughout the day I've worn both colours (Honey to work and Rendezvous out for dinner) and I'm was really happy with the pigmentation of each. Rendezvous is a brighter colour so I found that it stained my lips more than Honey, but that's to be expected. When looking at my growing lip product collection I noticed that my two Revlon Just Bitten Kissable Balm Stains are very similar to two Revlon Lip Butters that I own, Sugar Plum and Tutti Fruitti. The Revlon Just Bitten Kissable Balm Stains are definitely more pigmented and have longer staying power, they're just very similar in colour. The lip crayons have a slightly minty smell to them which I find quite refreshing. They don't make your lips tingle, it's just a fragrance. Would I recommend the Revlon Just Bitten Kissable Lip Stains? Definitely! I've already ordered one more (Charmed, I think). I'll add photos of that one when it arrives. What do you guys think of the Revlon Just Bitten Kissable Balm Stains? Are you loving all Revlon's new lip products as much as I am? 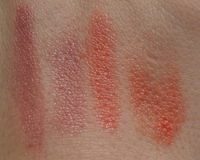 If you've looked at swatches online, what are your favourite Revlon Just Bitten Kissable Balm Stains? I've been thinking about subscribing for a while now but couldn't justify spending $45 a month on three subscriptions; Lust Have It!, Glossy Box AND Bella Box. After the Lust Have It! and Glossy Box merge, I, once again, thought about subscribing to Bella Box but was on the fence. I've always like a product or two in their boxes but, as of yet, no box had ever stood out at me. There was recently a Scoopon for the first Bella Box for $7.00 so I finally decided to do it. Anyway, my first Bella Box arrived today and I'm super impressed. It was posted about a week ago and the shipping time was fairly normal for shipping across Australia. I'm really happy with this month's box! As far as I'm concerned, it's one of the best one that they've ever released and I'm really excited to share the contents with you all. Much like Glossy Box, BellaBoxes comes in a reusable box. The boxes are packaged in a folding up box, as opposed to a mailing box, and I thought that was really cool. Simple things amuse me, obviously. In February I uploaded 1 Skin Solutions haul and review about a selection of products I was lucky enough to be sent and I've been a big fan ever since. I've been keeping up to date with their Facebook page, as well as in contact with the creator, and I'm so excited to introduce you all to their newest products, Lip Butters! These products were created to be a lipstick and lip balm hybrid, much like Revlon Lip Butters. They come in four fantastic colours (Almond Biscotti, Quava Lemonade, Strawberry Rose Champagne and Coconut Plum) and, once again, I was lucky enough to be sent one of each to review for you all. No, you're not seeing wrong. I have been super lazy and haven't kept you guys updated on my skin in soo long. Sorry! As I mentioned in my Just a Little Update #7 post I've postponed this for so long for a number of reasons (a lot of the time it was too dark to take a clear photo of my skin by the time I got home and washed my make up off) but, all excuses aside, I'm so sorry. Let's just face it, I was lazy! If you follow Born to Buy's Facebook page you'll know that I had my sister's wedding on the weekend. Yay. It was a fantastic day and night and she looked absolutely beautiful. A few weeks before the big day my sister came over after having visited the make up artist that would be doing all our make up for the big day. Not only did she have two fantastic eye looks to show me (I had to be the deciding vote), she also had an empty Real Techniques packet to show me. Obviously I instantly went insane and my sister contacted the make up artist, asking her where I can get them and how much etc. Real Techniques brushes are sold at hair supply stores in Western Australia. Luckily for me, said sister is a qualified hairdresser. Unluckily for me, she's lost the card she needs to shop at such places, along with her accreditation paperwork. Nice going, sis! Luckily the make up artist know my sister and was more than happy pick me some up at pass them on to me on the day of the wedding. A while ago, in my March/April Collective Haul, I mentioned that I bought a 15g bottle of Skin 79's Super Plus Beblesh Balm Triple Function BB Cream. "A triple function blemish balm cream that shields skin from premature aging with potent SPF 25, while whitening skin and reducing existing lines and wrinkles. The creamy formula effectively covers up skin imperfections, creating a perfect base for make up and foundation. Skin feels and looks fresh, with a gorgeous matte finish all day long. Recommended for combination and oily skin types." After hearing a lot about this product from a number of gurus on YouTube (including arose186 and missglamorazzi), I finally decided to buy this product. I was looking at a number of different BB creams, most from Skin 79, but I eventually decided on this one. Why? Because it's recommended for people with combination/oily skin and the packaging is hot pink. What's NOT to love? Although I bought this quite a while ago now, I've used this product almost every day in the past week and I'm quite impressed. The coverage of this product isn't amazing, but it does the job. The product comes out a beige/grey colour which can be quite off putting, especially if you're new to the world of BB creams. Don't stress though, it blends seamlessly into the skin. I'm not entirely sure how, to be honest, but it does. For me, this product has coverage that's somewhere in between a tinted moisturiser and a foundation. It's definitely buildable but, even then, it's not full coverage. The middle of my face (forehead, nose and chin) are quite red and, although it is dulled down, I still feel the need to add concealer to such areas when wearing the Skin 79 Super Plus Beblesh Balm Triple Function BB Cream. 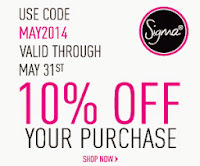 When applying this product, I normally work two layers into my skin with my Sigma Flat Top Kabuki (F80). The wear of this product is good, but not incredible. I know it's meant to be a primer, as well as everything else, but I still apply a primer underneath. I will normally get about 5-6 hours wear out of this BB cream before I feel the need to heavily touch up. Although the information says that the product leaves combination/oily skin feeling and looking matte all day, I wouldn't agree. I have combination oily skin and I feel the need to set this product with a powder. If I don't, my skin looks overly dewy and almost shiny. Every couple of hours I also reapply powder, but I think that's more of a habit than a necessity for me. I'm really enjoying using this as an everyday product, especially when I don't plan on doing too much, but I want a bit of coverage. Would I recommend this product? Definitely. If you're a fan of tinted moisturisers and other BB creams, I think you'll like this, especially if you have combination/oily skin. If you don't, there's a number of other BB creams from Skin 79 that may be more suited to you and your skin. Although I've never seen it sold in Australia, the entire Skin 79 range (along with a number of other Asian BB cream brands) can be purchased online. Google the product you're looking for and the country you would like it shipped to, and a number of stores will appear. Have you been getting into the BB craze? What's your favourite? A couple of days ago I uploaded a post saying how I was going to start saving money for next year's Sydney IMATS, as well as just in general. I decided, however, that it wasn't going to take effect until after this weekend. Why? Because my friend bought three of the L'Oreal Infallible eyeshadows recently and has been telling me how amazing they are. Yes, because I really need excuses to spend money on make up. Anyway, I decided I really wanted to try a couple of colours and, instead of paying full price when I'm allowed to shop, it made sense to buy them whilst Priceline had all L'Oreal cosmetics for 3 for the price of 2. I bought three colours; #002 Hourglass Beige, #004 Forever Pink and #012 Endless Chocolat. June is a hectic month for me. Tomorrow is my sister's hen's night, the weekend after is her wedding and then I have 120 hours worth of work experience to do over four weeks. Eurgh. At least I'll have handed all my assignments in by then, right? The end of May means the start of my favourite season, Winter, and I'm super excited to be typing this whilst all rugged up. This month I was planning on doing an old school type favourites video and giving you guys a bit of a run down of each product but I think I'm going to save that for next month. If I've reviewed a product previously on the blog, it will be linked so click away to see why I love it so much. If I haven't reviewed it, chances are I plan to!